In the latest microcode update guidance document, Intel may have intentionally unveiled the existence of upcoming Core processors. The microcode update guidance reveals that the Core i5-9400, Core i5-9400T, Core i5-9500, Core i5-9600, and Core i5-9600K are incoming. Although we believe that these CPUs will be part of the 9th-gen Core series, Intel is classifying these chips as an extension of the existing 8th-gen Core family in its documents. If this information is confirmed, it would be the first time that the first digit of the CPU model number didn't refer to the chip's generation. The upcoming CPUs will come with the same Coffee Lake die in 6+2 configuration (six-core and GT2 graphics). 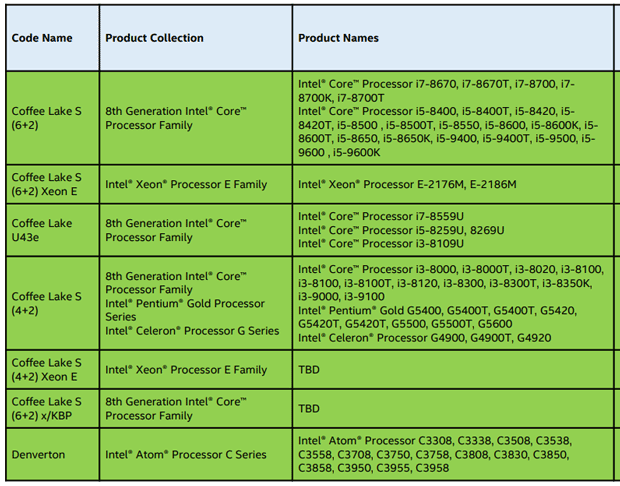 Furthermore Intel might add the Core i3-9000 and Core i3-9100 processors. Both CPUs will sport quad-core design with GT2 graphics. The guidance also unveils the upcoming unlocked CPUs like the Core i5-8650K. However there isn't any additional information about the Core i9-9900K or Core i7-9700K processors. These models should come with 8+2 design and they will be not affect by Spectre issue.